So, what are some ideas for things to do with your family and children while you are on Rhodes? We selected some of the best locations and points of interest that offer features or characteristics that are suitable for family vacations, or are suitable to spend some time with your family and kids because they are safe. We characterized those as Suitable for children. For example, a beach that has shallow waters, as there is no or less immediate fear that the child will get into deep waters. A resort that offers a relatively quiet environment or facilities that offer fun for kids. By no means should you think that a "Suitable for children" characterized location has to be "the" perfect place for your children. It only means that is has some (or many) characteristics that offer a better environment for younger children, or / and will keep them interested and occupied, and we discuss those characteristics below. Of course, despite our suggestions, we would like to note that it is important that you evaluate every location and place by yourself as well. The suggestions offered here are for informative purposes. First of all, when to go? April to June and September to October are great times to travel to Rhodes with children because the weather is milder, the crowds thinner and of course the service faster. Before we move on to the beaches, here is a small but very important reminder: Do not put your children out in the sun without proper sunscreen protection! Choose a high protection, certified for children sunscreen. You will find them in any supermarket, mini-market or pharmacy on the island. Being one of the most highly organized beaches on the island, Faliraki beach has a number of advantages that make it suitable for children of any age. 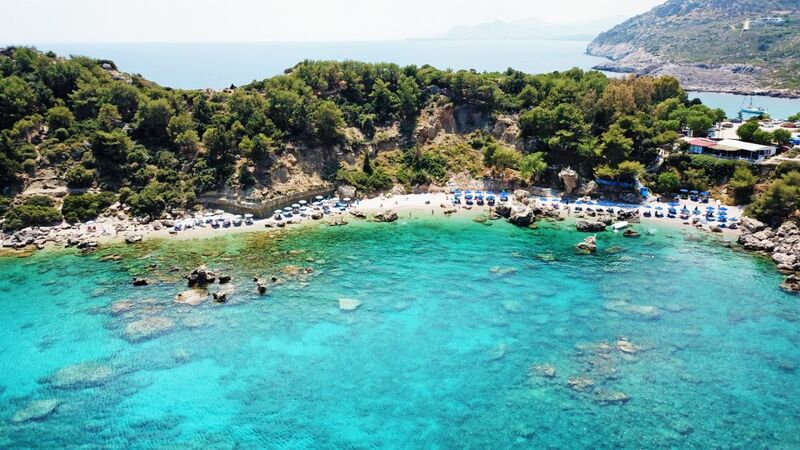 The waters are mostly shallow, the beach consists of fine sand, and it offers a number of facilities for fun and recreation, such as the excellent Faliraki Water Park and a Luna Park. At the same time, there is ample opportunity for the grownups to enjoy themselves as well. All sorts of watersports, such as jetski, waterski and banana boats, even bungee jumping are available. Be prepared though: during high season this is also one of the most crowded beaches in Rhodes, so if you are looking for something more quiet this may not be the best place to choose. Also, it is quite large: with a length of 5 km, you may need to walk quite a bit before you reach some of the fixed desired facilities such as the water park. A fine sandy beach, with shallow and very clear waters. While it does not offer all the amenities you can find on some other beaches, this is one of the perfect places in Rhodes if you like it a bit quieter. There are just a few canteens that will provide you with the basic food and drinks, and there are no watersports. However, if you are into snorkeling, the right side of the beach offers some suitable underwater rock formations. Tsambika beach is also a favourite among the locals. The well protected gulf offers shallow waters and fine sand, and there is ample opportunity for water sport activities. 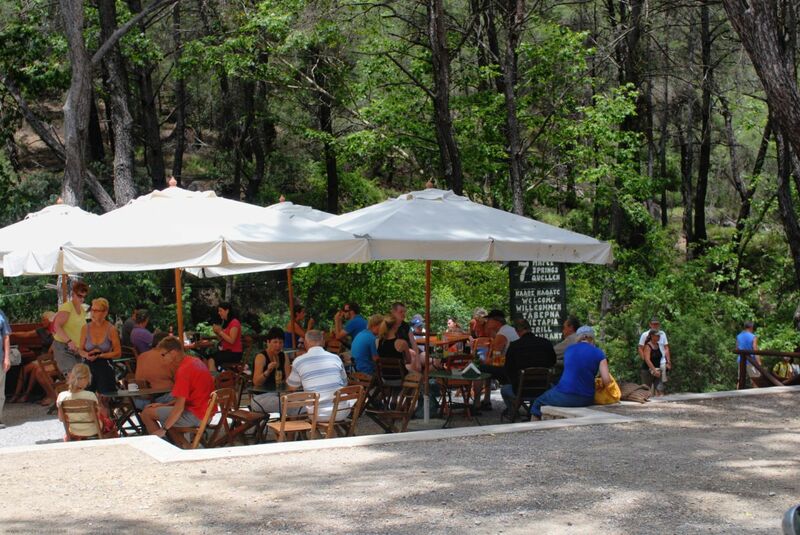 It is well organized, and depending on where you are staying on the island, a good alternative to Faliraki. However: This is one of the warmest places in Rhodes. During July and August, the temperatures are quite high here, reaching or even exceeding 35°C - 40°C (104°F) during high noon. This is something you may want to consider if you are traveling with babies or elderly family members, or if you are sensitive to heat for any other reason. Excursion tip: If you can handle some stair climbing, the Monastery of Tsampika, overlooking the bay, is well worth a visit. Kolymbia (Kolympia) is a low profile seaside resort, with neither the luxury of Ixia nor the intensity of Faliraki. 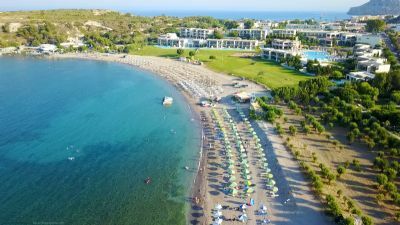 It is a great spot for a relaxing family vacation, as it combines a family friendly resort, with suitable hotels and nice restaurants (tip: the Limanaki and the Nissaki restaurants, which the locals also tend to favour, are well worth a visit). Depending on which of the 3 beaches you choose, watersports are also available. The beach to the right is also suitable for snorkeling. This may not necessarily be the best beach for very young children, unless they are fascinated by snorkeling, as this is one of the best spots for this activity on the island. This little bay is one of the most beautiful in Rhodes. The waters here are crystal clear, and are painted with a distinct emerald green-blue color thanks to the surrounding greenery, and neither very deep nor to shallow. Yet, it is also extremely popular, thus often quite crowded. The canteen overlooking the bay will provide you will all the necessities. The beach at Lindos is also suitable for your youngsters, however here you will find very limited water sports activities (if any). You will find many good restaurants directly on the shoreline here, and the village of Lindos with it’s majestic Acropolis overlooking the beach adds to the atmosphere. Other than the shallow waters though, this is not necessarily a fun beach. Vlycha beach is neighbouring Lindos, and offers considerably more fun opportunities, as watersports are available. The waters here also deepen very gradually, albeit they are not as shallow as on other beaches. Canteens, restaurants and a few hotels are also available, making this location also attractive as a family vacation resort. The Butterfly Valley is one of the most charming attractions in Rhodes, even for children. Walking through the narrow, forest surrounded valley, offers a sense of discovery. A creek runs all the way through, and offers extra cooling even during the hottest summer months. There are spots where you can rest and enjoy a coffee, soft drinks or ice cream. The highlight is, of course, the thousands of butterflies that fill the valley during mid July and August. Please note: instruct your children to not disturb the little creatures. They need all their energy in order to complete their reproductive cycle. You can read more about this on the page linked above. Tip: if you make it all the way to the top of the valley, don’t stop: just a few hundred meters more, and you will find yourself at the Kalopetra Monastery, which is also well worth a visit. 7 Springs, just as the Butterfly Valley, offers a cool, magical landscape, even in the heat of high summer. This is a true oasis actually. Your kids will surely enjoy having their ice cream or soft drink at the cafe-restaurant next to the streamlet while observing the ducks, peacocks and other animals found in the area. And if you feel adventurous enough, and are not claustrophobic, you can walk through the narrow dark tunnel, while your feet are getting wet by a gentle shallow water stream, to find yourself in front of a lake in which you may also enjoy a bath in the freshwater. Be careful though: since the water is fresh, just as in swimming pools, there is less water buoyancy, so make sure you and your youngsters are aware of it. Also, the water is quite cold. Your kids will love this! The Aquarium is located in the basement of the Hydro-Biological Station of Rhodes and offers the visitors the chance to have a close up view of the marine life of the Eastern Mediterranean, providing the impression of being underwater. You will find a wide range of interesting specimens of Mediterranean organisms such as reefs, sea flowers, octopuses, clams, decapods, turtles and numerous fishes. 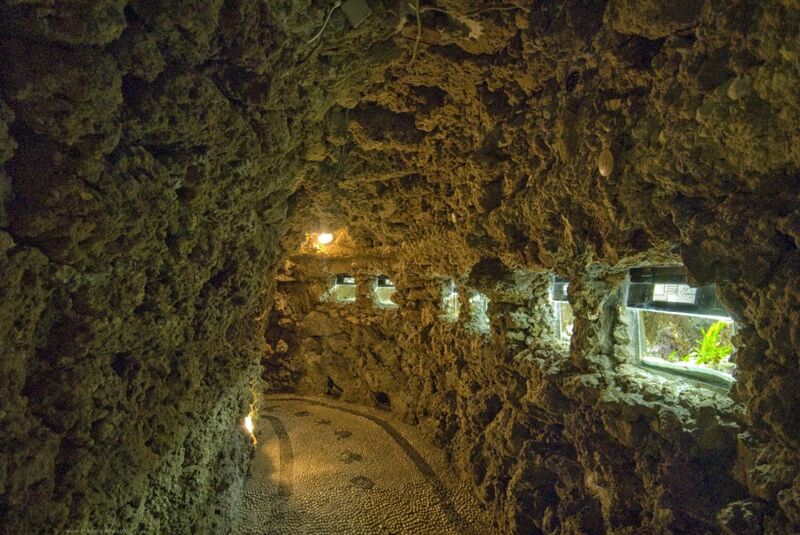 The experience of walking through the narrow, pebbly, stonewalled tunnels while gazing at the aquariums is quite unique. Eleousa is located in the lush foothills of Mount Profitis Elias (Profitis Ilias). If you are traveling with children, you will appreciate the relaxing environment, the lush green nature, and the good food offered at the local taverns, since once you arrive there, you will find yourself in a tiny village surrounded by plane trees, in the heart of one of the most verdant parts of the island, offering pure country air and the purling sound of running waters. A couple of hundred meters towards the mountain, you will find a large round cistern, in which is home to a large population of Ghizani, a local, protected fish kind. Yemista: Veggies (usually tomatoes and sweet peppers) stuffed with rice (and sometimes also minced meat). Pastitsio: Macaroni baked with minced lamb, and a layer of Bechamel Sauce. Tzatziki: A sauce or dip made from cucumber, yogurt and garlic. Pitaroudia: Made from flour, onions, tomatoes, and finely chopped peppermint, and fried in hot oil. Loukoumadhes: Ball-shaped doughnuts served with honey and cinnamon. Politiko pagoto: Constantinople-style (slightly chewy) ice cream made with mastic. Spoon sweets of all types: They are made from various fruits and nuts, such and orange, lemon, grape etc. Melekouni: A healthy local sweet, made primarily of honey and sesame. Rhodes offers a large number of family friendly accommodation. Hotels and resorts often have package deals for families and these places are generally set up to cater to kids with childcare options and babysitting, adjoining rooms, paddling pools, cots and high chairs, kids' clubs, children's swimming pools, playgrounds, exciting activities and children's menus, as well as luxurious suites with sea views and spas. 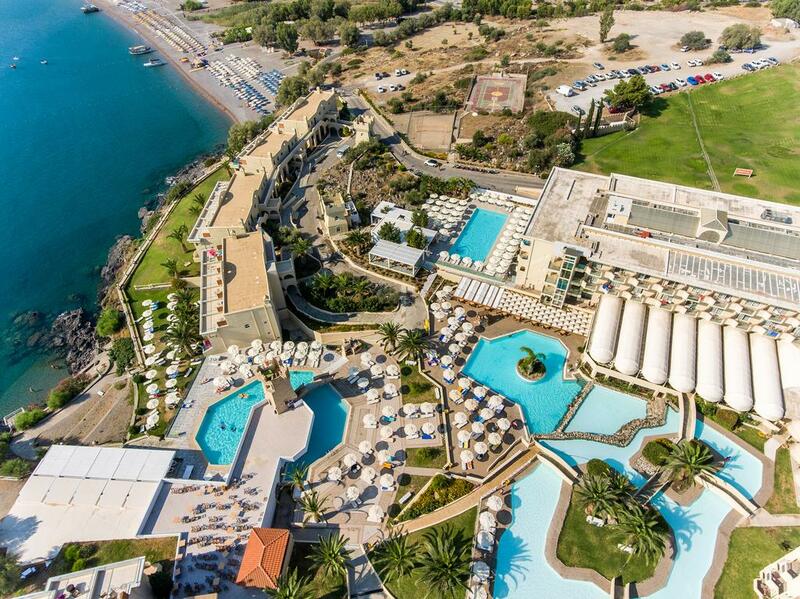 Here is a short list of family friendly hotels in Rhodes that may interest you. Right on its private area of Faliraki Beach, Epsilon Apartments features self-catered accommodations with Aegean Sea view. 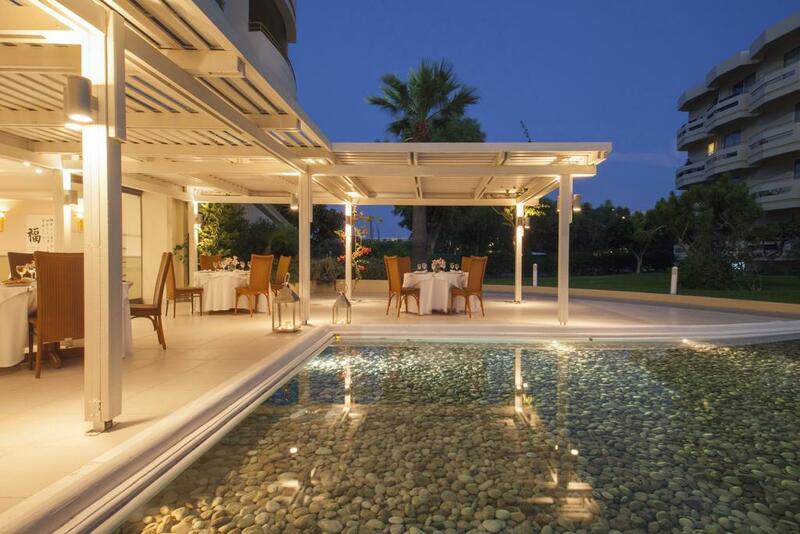 Facilities include an outdoor pool with separate children’s section, a tennis court and mini market. The colonial-style resort is built by a wonderful beach and surrounded by palm tree gardens, 3.1 mi from Lindos. It offers 5 outdoor pools, 1 tennis court and 3 theme restaurants. Lindos Royal’s large and bright rooms are tasteful and enjoy amazing views of the blue Aegean Sea and the surrounding coves, the gardens and the pools. 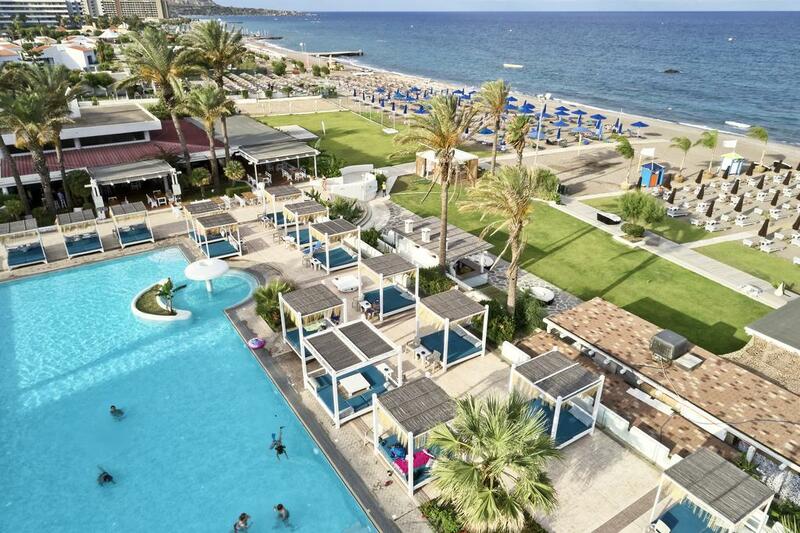 Sitting on the western coast of Rhodes, the Electra Palace offers free sun beds at the pool and at the beach with waiter service, free open-air parking and elegant rooms with sea, pool or garden views. The central part of the hotel’s garden is taken up by the imposing free-form swimming pool with water features and wooden bridges. Adjacent to it, is the children’s pool.